SGD 43-A is a 4.3” capacitive touch display designed for use with PanelPilotACE Design Studio, a free drag-and-drop style software package for rapid development of advanced user interfaces and panel meters. This off the shelf display features a wealth of hardware interfaces, including four 16-bit bipolar analogue inputs (to a maximum of ±40V d.c.), eight digital input/output pins, two alarm outputs, four 8-bit PWM outputs, PID Control, multi-channel data logging and trend graphs, serial RS232 and accessories available for RS485 communication and four-channel thermistor temperature measurement. The development kit, SGD 43-A-DK+, is the best choice if you are starting to develop on the PanelPilotACE platform. It includes all you need to begin: an SGD 43-A, a development board and a USB cable. The board provides switches, dials, LEDs and screw terminal connections for all the input and output functionality of the SGD 43-A. The PanelPilotACE University has a multitude of resources to make your programming experience as quick and effcient as possible. From How To Guides and Frequently Asked Questions to an ever growing number of pre-configured ACE Templates and an Icon and Graphic Library, visit the University and make your PanelPilotACE project even quicker. 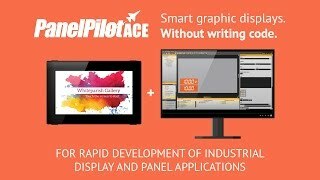 Four 16-bit to ±40V d.c.
PanelPilotACE design software provides a number of building blocks which allow users to drag-and-drop elements onto the screen to quickly create advanced user interfaces. Add-on board allowing RS485 communication.